Have you felt like you've lost touch with yourself, and are questioning your core values? Are you looking for ways to rediscover who you are and where your life is headed? 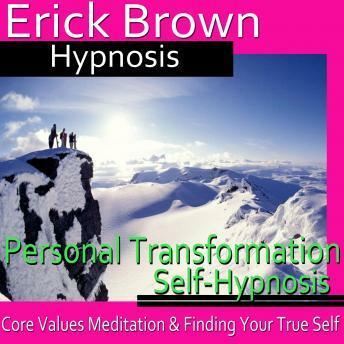 Take charge of the path your life is on and get deeper connected with yourself with this hypnosis program from Erick Brown. "Personal Transformation" will help you to realign your emotional and moral compass and give you answers to questions you may be having about where your life is headed. Subliminal suggestions for deep relaxation and positive change will be received by your subconscious, increasing your connection to yourself and your core beliefs. Don't spend another day wondering how to connect with yourself and what you stand for. You can transform and embrace your life today.